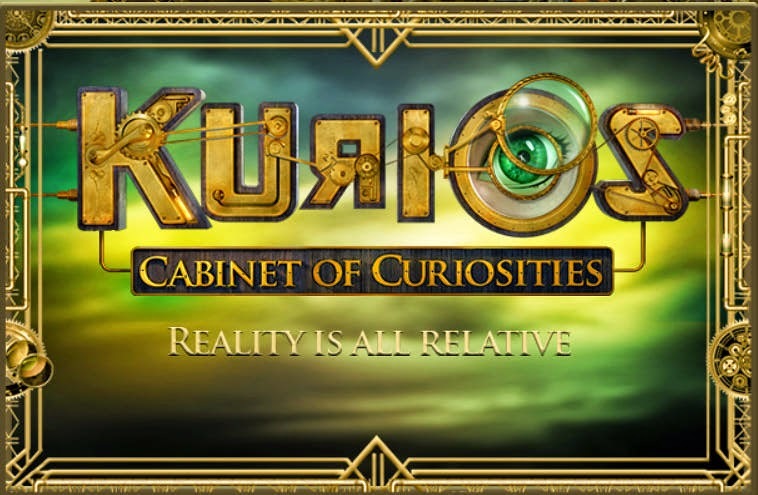 The folks at Cirque Du Soliel have created a new show, this one right out of the world of Steampunk. Again, this shows the popularity of Steampunk and the many different directions one can take the genre. I don't know much about the show and actually, I don't want to. I've seen a couple Cirque shows and I'm always blown away by their imaginative productions. BUT, given that I am also working a theatrical show in that genre, I don't want to be influenced by anything they are doing. Once Upon A Time. Many great stories began with 'Once Upon A Time'. This story today does as well, except unlike Fairy Tales and stories of old, this story is true. Once Upon A Time, there was a Great Theatrical Magic Show, the likes of which had not been seen for many years. It was a show out of step with the times. It was a show that harkened back to the earlier part of the 20th Century. It was a show that was hard to describe, but the generally all agreed it was an 'amazing spectacle'. The show was called Le Grand David and His Own Spectacular Magic Company. Actually an odd name for a show, yet that is what it was called. Le Grand David was played by David Bull and he received top billing as could be seen on the posters. But the brainchild behind the show was an older wizard, his stage name was Marco The Magi, and he was played by Cesareo Pelaez. 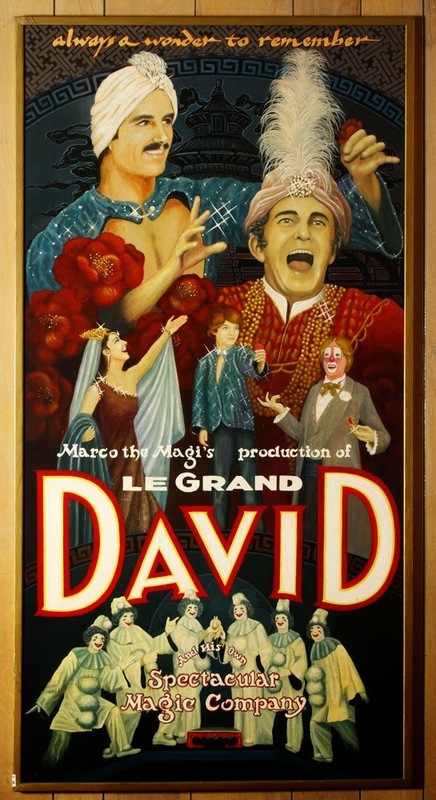 On many posters, the name Le Grand David was printed/painted in bold letters, but often in smaller letters near the top of the poster were the words 'Marco the Magi's production'. The show ran for 36 years until Marco/Cesareo passed away. He died before the performing season was over, so the cast decided to finish the season in tribute to their patriarch. And then it was no more. I could write volumes about the show and the cast. In fact, I have written quite a lot over at my other blog. But I'm not really interested in doing a bio of the show right now. Rather, I'd like to show how that show relates to Steampunk. Steampunk has a lot of DIY built into it. If you want to create costumes, props and such, it's rather tough to go out and purchase ready made steampunk items (though as the popularity grows it is getting easier to purchase some things). The joy of steampunk is just as much in the creation of things as it is the displaying of these items. This was the way the Le Grand David show operated. They built the props, the illusions and the set pieces. They sewed the costumes and curtains. They painted the posters, scenery and so forth. Most things were done in-house. The results were astonishing. The show was very retro, in that it was really from another time. The show was a mixture of the types of shows young Cesareo saw in his youth. The traveling magic shows of Fu-Manchu, Chang, Richiardi and others from the 1930s-50s. In fact, some of the routines from these older shows found their way into the Le Grand David Show. Anyone who had seen those shows would definitely know where the inspiration came from. But everything in the LGD show had it's own unique touches to it. Look at this prop to the left. To me it has a very Victorian appearance. 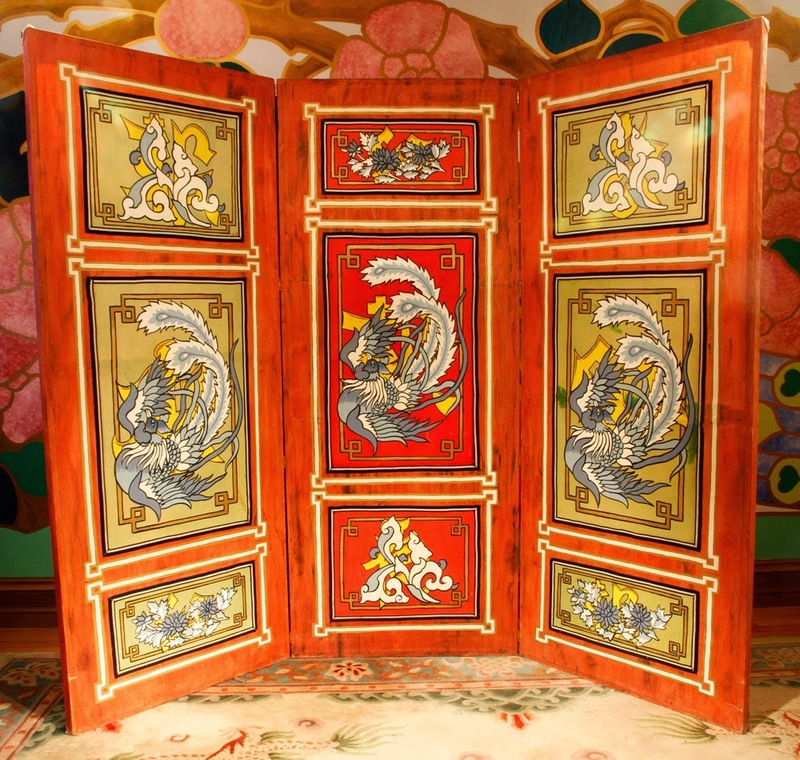 A 3-Fold Screen, colorful yet not overdone, rather the colors are more subdued. 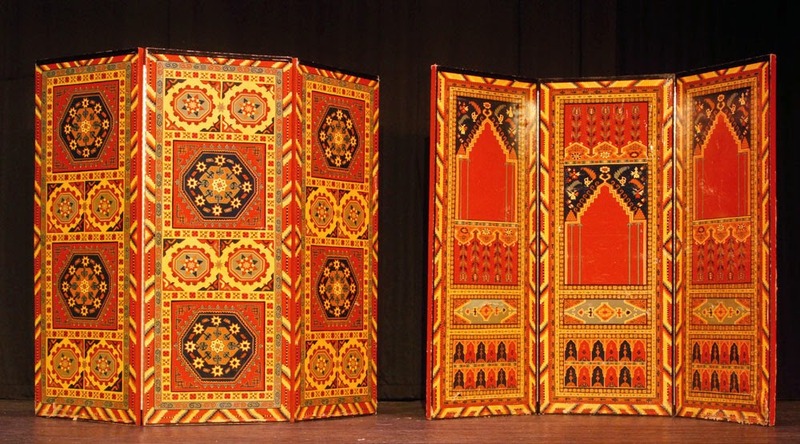 The original inventor of this illusion was very much the product of the 19th Century. His name was Theodore Bamberg, he was born in 1875 and he came from a long line of magicians. His stage name was Okito, and for many years he performed what was called an Oriental Magic Act. His creations were too numerous to mention, but they were all works of art. Also, Theo built them all by hand. He was a skilled craftsman. He knew how to handle tools and how to work with wood, metal and fabric. In addition to his Okito show, he also performed something called Shadowgraphy. What could be more Victorian sounding than that? Shadowgraphy was the art of creating shadow images with your hands. Theo Bamberg was not the first to develop this into a stage act, but he was certainly one of the best. Okito was the father of David Bamberg, who performed as Fu-Manchu. It was Fu-Manchu who was one of the biggest inspirations of Cesareo's life. early days. At some point they added a new 3 Fold Screen to replace the one pictured above. Again, the colors are not bright and circus-ey but rather almost earth tones. Notice the very different design scheme however. Please also notice how intricate that design is. Now consider this, that was painted by hand. And painted by one person, a fellow named Rick Heath. Rick was a lead painter in the company and he painted scenery, props, illusions, posters and much much more. He hand painted ceiling tiles in the theatre lobby. He painted the side walls in one of their theatres (they owned two of their own theatres in the same town). When I say he painted walls, I don't mean like a normal construction painter might do, no. He painted flamingos on the walls, hundreds of them and they made an awe inspiring site. 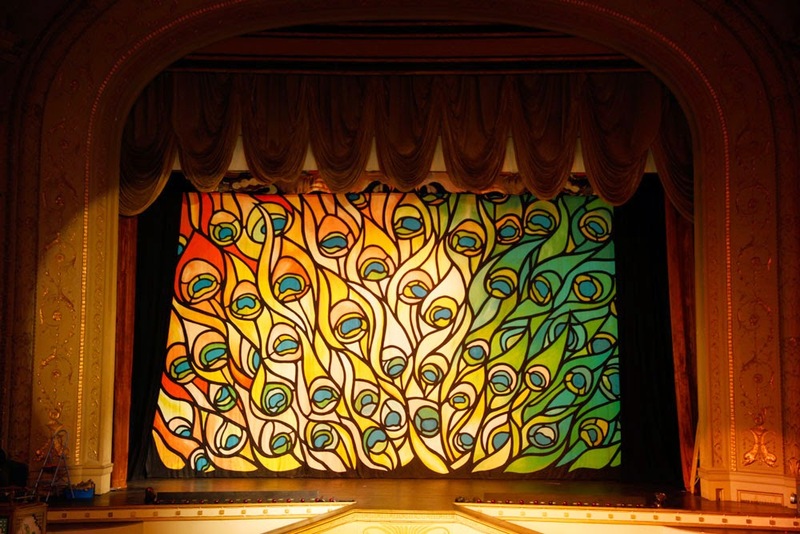 I will leave you with one final image, a picture of one of the breathtaking curtains from the LGD Show. This one served as the backdrop for Marco the Magi's version of The Floating Table. I remember the first time I saw this curtain. I was dumbstruck by it's beauty. It just so happens that today, I own this magnificent backdrop. It serves as a reminder of what you can do when you put your mind to it. Is it steampunk? I don't know. But it's likely going to be in the larger version of The Steampunk Illusionist Show in some capacity. Enjoy!